Kevin Theisen is the President of iChemLabs, which funds, develops and hosts the open source ChemDoodle Web Components. While OpenGL ES (OpenGL for Embedded Systems) is only a subset of OpenGL, it has proven to be quite effective in producing great 3D molecular graphics on non-desktop platforms. Brad Larson at Sunset Lake Software mastered the technology to create the impressive Molecules app on the iPhone. Expect this technology to allow for quick and engrossing graphics without the need for fully installed applications on the desktop. One issue is with competing technologies, such as applets, other multimedia plugins and those technologies not yet developed. While it is true that the internet is a continuously morphing environment, this author is confident that Canvas technology will be running the websites of the future. The reasoning is that it is a native browser technology, and users will be likely to choose it over cumbersome 3rd party plugins. Take CSS for instance, if website publishers are given a choice between using CSS or some other 3rd party plugin to organize their HTML pages, the resounding answer would be CSS. Additionally, web site visitors don't want to wait for applets to load and developers don't want the hassles associated with them. In order to compete in the future, developers will have to create engrossing Web 3.0 sites, and Canvas is the answer. Now that I have provided some background on the technology, I will be demonstrating how to write a web application using the ChemDoodle Web Components. 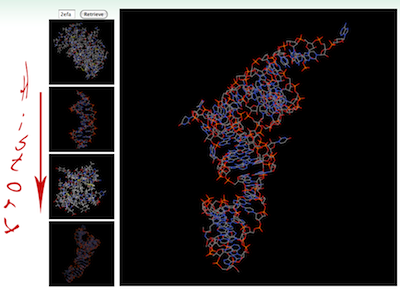 The application has a simple goal: visitors search the PDB using structure codes and then view an animation of the result, while the most recently viewed structures are saved in a graphical history. The finished product can be seen here. Use the browser's View Source function to see the source in its entirety. Note that previously Canvas referred to the HTML 5 element. Canvas from now on will refer to the base ChemDoodle Web Component class of the same name. To begin, I always sketch a layout of how the application appears in my mind. I pictured a simple layout, with the history to the left and search form at the top-left corner. Conveniently, the use of the ChemDoodle Web Components allows me to produce any layout with any functionality I wish. Relying on applets may confine us to using a predefined interface. Since I want the left and right sections to align horizontally, I'll use a HTML table for simplicity. The table will have 1 row and 3 columns, 1 for an image used to provide explanation for the empty history components, 1 for the history and search form, and 1 for the animation. <form name="PDBForm" method="POST" action="/CDWProteinDataBank.php" target="HiddenPDBFrame"
<iframe id="HMGF-rotate3D" name="HiddenPDBFrame" height="0" width="0"
The user's viewing history will be placed below the search form. I would like this to be a graphical history, so I want the images of previous structures to be shown here. In addition, clicking the structure should transfer it to the main rotator and hovering should highlight it for visual feedback. The possibilities are endless, and I will extend the ChemDoodle Web Components' Canvas base class to provide this functionality after this section. I call the class HistoryCanvas, and very simply, I create four of them with a dimension that allows for horizontal alignment with the rotator canvas, and stack them on top of each other. I have now laid out all the components on the HTML page. Now that the HistoryCanvas class has been defined, there are three functions left to be completed: setupVisuals(), GetPdbFromFrame(), and cycleMolecules(). The first, setupVisuals(), just sets the visual specifications of an input component so that all created components can be standardized by one function. The second method, GetPdbFromFrame(), is the function to be called after the PDB file has been retrieved and inserted into the hidden frame. The function retrieves the file, parses it, pushes the currently rotating structure into the user's viewing history and loads the new structure. The last function, cycleMolecules(), pushes the currently animating structure into the user's viewing history. The scale attribute is transferred as well as the structure so it doesn't need to be recalculated. 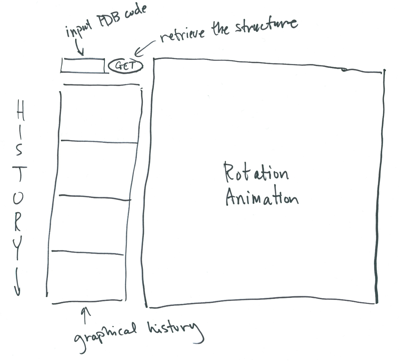 The top history component must load the molecule from the rotate3D object to make sure to fit it properly, since the component sizes are different. And that finishes the project. Load it up to see the web app in action!